Krishak Mukti Sangram Samiti leader Akhil Gogoi, while speaking to ANI, said that if the proposed bill is passed, then the Assamese people will become a minority in their own state. 70 organisations, led by the Krishak Mukti Sangram Samiti, have hit the streets in Assam. 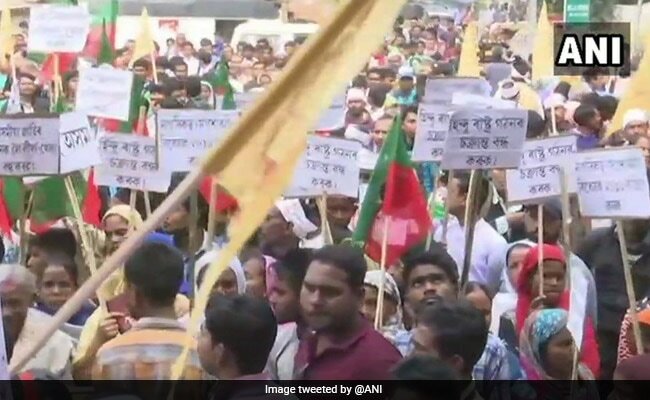 Prohibitory orders were clamped in three police districts of the city and security beefed up in view of the Assam secretariat gherao programme called by several organisations on Friday against the Citizenship (Amendment) Bill, 2016. Barricades were placed around the secretariat and Assam Police and CRPF forces were deployed in large numbers to prevent the protestors from staging their Sankalpa Shikha Jatra against the Bill. (KMSS), a peasant organisation, and Assam Jatiyatabadi Yuba Chhatra Parishad (AJYCP), a student organisation, was likely to see the participation of 68 other organisations from other parts of the state during the day, the organisors said. KMSS leader Akhil Gogoi along with members of 70 organisations staged a protest meeting on the premises of the Dispur Press Club, adjacent to the secretariat, accusing the Sarbananda Sonowal-led BJP Assam government of working against the interests of indigenous people of the state by supporting the bill. The bill threatens the identity, language and culture of the indigenous people and unity of Assam, he charged. The Citizenship (Amendment) Bill, 2016 was introduced in the Lok Sabha to amend the Citizenship Act, 1955. Large sections of people, organisations in the northeast and leading political party AGP, which is an ally of the ruling BJP, are opposed to the bill saying it will nullify the provisions of the Assam Accord of 1985, which fixed March 24, 1971 as the cut-off date for deportation of illegal immigrants irrespective of religion. Prohibitory orders under section 144 of CrPC had been imposed in the three police districts of Guwahati city with immediate effect on Thursday, ahead of the gherao programme against the Citizen (Amendment) Bill, 2016. Other speakers at the meeting alleged that protestors who had taken out motorcycle rallies from different parts of the state were not allowed to proceed to Guwahati. Stating that the organisers had prior police permission for holding the meeting, the demonstrators accused the administration of imposing the prohibitory order "to muzzle the democratic voice of the citizens". Accusing the chief minister of functioning "under the orders of the RSS", the speakers urged Sonowal to "give up his Hitlerian rule as it was against the people of Assam". Bike rallies starting from Jonai, Diphu, Sadiya and Dhubri were allowed to proceed to Guwahati one at a time and not in a group as permission for Friday's meeting was given for a gathering of 1,000 people and it had already exceeded that number, police said. Protestors travelling from Sadia, Dhubri and Diphu travelling by trains to participate in the protest alleged that they were not allowed to board trains and instead detained to prevent them from proceeding further. Assam Director General of Police Dr Kuladhar Saikia had Thursday warned that the administration would take strong action against anyone trying to break the law and strict vigil would also be kept in Guwahati.